In this edition, John provides answers on wartime matches, official Test status, yellow cards and the most impressive run of Tri-Nations results. A. This is an interesting piece of memorabilia. 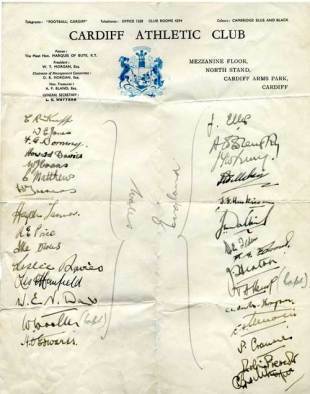 The signatures are of the Wales and England teams that took part in the so-called Red Cross (unofficial) wartime international at Cardiff Arms Park on Saturday, March 9, 1940. England won 18-9. The Times reported that more than 40,000 attended. Official international matches were suspended during the War which is why the game doesn't appear in the record-books or on Scrum's Statsguru database. The wartime players were never awarded caps. The rationale for not recognising them was that, owing to service calls, not all of the best players were always available for selection in Britain, Ireland and the Dominions. Even so, most of those who took part in the match had won full official caps before the outbreak of War. For Wales, all bar Knapp, W E Jones (later a well-known Glamorgan cricketer), Dorning, Owens and H O Edwards won full official caps. Evans was capped in 1947. Tanner, Travers, Manfield and Howard Davies were capped both before and after the War. Willsher, F G Edwards, C L Newton-Thompson and Gilthorpe never won full England caps. The sheet would have quite considerable autograph value as it contains Obolensky's signature (second on the England signings). This was his last big game before his untimely death on the March 29, 1940 - fewer than three weeks after he signed this sheet - in a flying accident near an RAF aerodrome on the East Coast near Ipswich. Obo had been selected to play in the return Red Cross match at Gloucester on April 13 where England again won, 17-3 this time. Twickenham was out of commission during the War. A. Scotland, Ireland and Wales were the founders of the International Board in 1886 and England joined them four years later. One of the Board's early rulings was that its member Unions could only award caps (i.e. confer official Test status on international matches) for games against other member Unions. Japan did not become members of the Board until 1987. The Four Home Unions strictly adhered to the ruling until the Board announced at its annual meeting of March 1981 that forthwith caps could be awarded for matches against any opponents at their member Unions' discretion. England became the first Home Union to take advantage of the new ruling, giving caps for their two Tests against Argentina in the spring of 1981. Scotland followed suit for their game against Romania later the same year, Wales did so against Romania in 1983 (losing famously in Bucharest) and Ireland's first cap-match against non-IB opposition (also Romania) followed in 1986. Since then, of course, Argentina and Romania, like Japan, have become members of the Board. The first match between Wales and Japan for which the Welsh awarded caps was at Cardiff in 1993. A. Ben Clarke of England was the first player to be shown a yellow card in a Test match. He was carded by French referee Patrick Thomas for stamping on Bath club-mate Simon Geoghegan in the 63rd minute of the Ireland-England Five Nations match at Lansdowne Road, Dublin in 1995. At the time, however, the card only signified a warning and Clarke remained on the field. The sin-bin did not reach international rugby until two years later, after a successful trial during the 1997 Super 12 tournament. It was then introduced during the Tri-Nations and Australian centre James Holbeck was the first to go to the cooler during the South Africa v Australia Test at Loftus Versfeld, Pretoria, on August 23. He was off the field for ten minutes near the end of that match and it was only when he returned, just before the final whistle, that those present realised that he had been sin-binned rather than sent-off. Cards for sin-binnings and sendings-off were not introduced until a later date. A. The longest try-less England run is 450 minutes spanning seven international matches between 1958 and 1960. In 1959, they failed to score a try in any of their International Championship matches. The drought ended in January 1960 when the Sale and Old Millhillians wing Jim Roberts scored a couple of first-half tries at Twickenham against Wales. Between 1993 and 1994, Will Carling's England teams went 438 minutes (also spanning seven internationals) without crossing - from the try scored by Tony Underwood against Scotland at Twickenham in 1993 to the one scored by his brother Rory against Wales (also at Twickenham) more than a year later. A. Haydn Tanner was the last surviving Welsh player who appeared pre-World War 2. The current oldest surviving Welsh international is the former Cardiff flanker Gwyn Evans, who was born in Treherbert on August 17, 1918. He won his first cap in the first post-war official international played by Wales, against England at a bomb-damaged Cardiff Arms Park in January 1947, and had the distinction of scoring one of Wales's two tries in that match. Gwyn Evans went on to play a dozen consecutive games for Wales up to 1949. A. The best winning run is eight matches by New Zealand between 1996 and 1997. They achieved Grand Slams in the first two seasons of the competition's history when each side played only four games, before falling to a Tri-Nations whitewash in 1998. They repeated their eight-match winning feat between 2005 and 2006, when the Tri-Nations was expanded and each nation played six games. The worst losing run is six by Australia between 2004 and 2006 and included a whitewash in their four games in the 2005 tournament. The Wallabies lost another six on the trot between 2008 and 2009, ending the run with a 21-6 win in Brisbane over this season's eventual champions, South Africa.